The Baby Trend Sit N Stand Double Stroller includes a twin five-point safety harnesses for each seat, so two babies can ride safely. The rear canopy seat back in this double buggy provides shade for your baby and can be removed to allow older children to stand or sit on this baby stroller. So, whether you have twins or two children of different ages, this double buggy can accommodate them safely, whether you're shopping, or just strolling around town. The sit and stand plus double stroller features 2 trays with cup holder for the children and a covered parent organizer with 2 cup holders. Front Seat recommended use: Upright, unassisted child up to 40 lbs. Back Seat recommended use: 2 1/2 years up to 40 lbs. 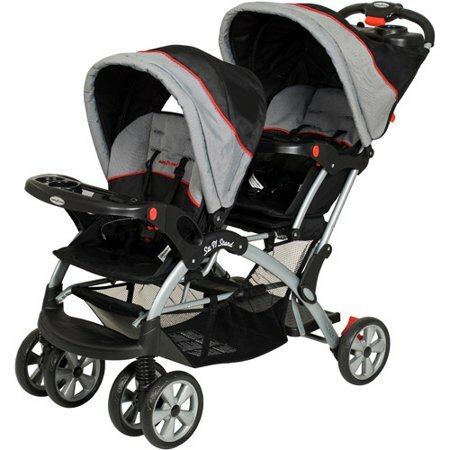 See all strollers on Walmart.com. Shop strollers including jogging strollers and double strollers. Save money. Live better. We purchased this stroller when our son was 3 and our daughter was just born. We never used the second seat just the platform and bench seat. The infant car seat fit very snug. Our son loves his "big brother seat". We don't go any where without this stroller. My kids are 4 and 1 now and we still use this stroller. The only complaints I have ever heard are the basket isn't easy to get to. Our solution was get a mommy hood and hang the diaper bag or we just place the items from the diaper bag in the basket individually. Easy fix. Works great for us and we love it. Still looks like new and we use it alot. Very durable and easy to work. Anyone with 2 small kids needs this stroller. Love this stroller! Light weight, easy to assemble, maneuver, and comfortable for babies!! good price and perfect for 2 carseats. It's a beautiful stroller, maneuvers well for its size the only thing is to get to the basket I will have to remove the sit and stand foot rest in the back, but I'm very happy with it and it didn't cost me an arm and a leg. I bought this over similar models because it had the full, reclining back seat that is removable to turn it into a sit and stand. My daughter is too young for the bench seat or standing just yet, but I wanted a stroller that would last us many years. Even though I will usually only have one child in it, I could use the extra space for storage and will have the extra seat for when my granddaughter is with us (Yes, I have a 1-year-old daughter and a 1-month-old granddaughter!). It folds down easily, although it is bulky and heavy, so if you are looking for a quick solution to popping it in and out of the car, I would choose another model. It is also VERY long and big, but that is what I prefer...plenty of comfortable space for the kids and storage space underneath. My husband likes this because he is tall and the handle sits quite high for pushing instead of him having to stretch for the handles like he does on most strollers. My children will be 16 months apart with my baby due next month. I loved that this is going to grow with them for years to come. I only had slight difficulties putting it together from understanding the instructions and folding and unfolding but it was mainly human error (watched a video) After I realized my errors...it was easy to lift and put away and to remove the back part for the sit and stand. I am just using a carseat that I had last year from another maker and it seems to fit fine. I have a newborn & very active two year old. This was perfect for them. The only thing I dislike is it's huge and difficult to fold. You'll definitely need a truck for this. It works great for our 2 yr old and 2 month old. It was super easy to put together and not overly complicated to figure out.The safety latch on the side confused for a few minutes (but doesn't every baby contraption?lol). It can be a little difficult to get items into the compartment under the seat if the child is in the back seat and I wish the sun protector over the back seat came out a little farther. It seems fairly light for a double stroller. That said, the overall comfort and material could be better. For instance, the back rests are basically hard plastic covered with cloth. Our Graco car seat fits into either compartments just fine. It rolls and steers very easily, especially for having such a long wheelbase. Folds up really easily except one cup holder needs folded down before folding and sometimes the position of the front wheels prevents it from folding completely. Overall, this is a GREAT stroller for the lower $100s. I would recommend this to friends. It being a double stroller obviously I expected it to be big, But it kind of surprised me just how much space it takes up in the trunk of my kia sorento. But it is awesome overall. I got this to use for my 4 almost 5 year old and my 2 year old...The two year old sits in the front because the seat is shallow but it fits her fine. My 4 year old is a very small 4 year old in the weight area but he is an average height he fits fine in the regular seat or the bench seat. . Hope this helps! we bought this stroller for a visit in the united states with a 5 year old and a 2 year old. we really loved it. it holds both kids and still maneuvers nicely. i'm not saying it's like walking around with a 6 month old baby, but it is very comfortable, considering. we used it in NYC, disney parks, and some other cities and found it easy to fold in flights. the basket is pretty large but when you place heavy objects in it (like water bottles) it hits the floor. It's an OK stroller. We needed a double stroller for a Disney trip. So I wanted double seats. The back seat is hard to get in and out of for my 2yr old. The drink tray scrapes her legs and it catches her shoes and would pull them off every time wed get her out. Also the basket underneath is almost impossible to use once you have a second child in the back and you have to try to get stuff in and out. My daughter complained after a few days that the seat hurt her. It's Pros.... it does drive pretty well for such large stroller. It's not extremely heavy so as a woman I don't have trouble loading and unloading it. It closes pretty easy with some assistance squeezing it so the safety latch locks. It got the job done but wasn't the easiest transitions in and out the stroller constantly. (It was our first Disney trip, I should have bought a side by side. Something easier to get in and out of) but it wasn't extremely difficult to work with in crowds and the stores. What types of carseat can you use with this stroller? 2. The stroller is designed to be used with a baby trend car seat only, that was a bit of a bummer, but when I bought the matching car seat I realized that baby trend products are by far superior to any others. I am very happy with the car seat and the stroller. 3. on the baby trend website it says its compatible with certain type of britax and evenflo carseats as well. 4. I would think any that clamps onto a shopping cart. 5. I hope this helps. I have a Graco car seat, so maybe it won't be as helpful as you would like. The tray folds down to make a thin "bar" type place for the seat to click onto. Then, you strap a safety strap from the seat of the stroller through the hooks you would use to secure the seat into the car if you weren't using a base. It is adjustable, so I would assume just about any car seat would fit. Again, I hope that helps. 6. I have a Graco Snugride and it fits. I am not sure what other carseat fits this model. does this product come with two infant carseat? 1. it does not come with car seats, you attach your own, and yes, you can do 2 car seats. 2. No, it doesn't come with a carseat at all. You have to purchase that separately. 3. no. Just the stroller. 4. No, it does not coem with a car seat at all. Purchase separate. Is the trim red or orange? 1. The trim is red. 3. There are many versions of the baby trend sit n stand, but the millenium is more of a purple/blue color trim. 4. More red than orange. Warranty Information:Parts and repairs for products purchased in the United States with defects, malfunctions or failure directly resulting from the quality of material used and/or workmanship of the finished product during the first 180 days after purchase, with proof of purchase, are covered under the manufacturers warranty at the discretion of the manufacturer. Baby Trend will cover shipping from and to consumer in the event of a repair if applicable.